Am-Rail uses high quality replacement rails, the lifespan averages 50-60 years, depending on how much freight is transported annually on the line and other factors. 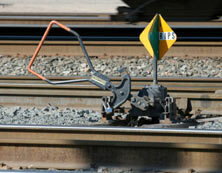 Please contact us for any railroad track construction, maintenance, repair, or inspection needs you may have. We would like to add you to our growing list of satisfied customers. You may also call (888)-267-2457. Am-Rail Construction, Inc.™ is an equal opportunity employer.